Neodymium magnets that easily stick to flat surfaces. 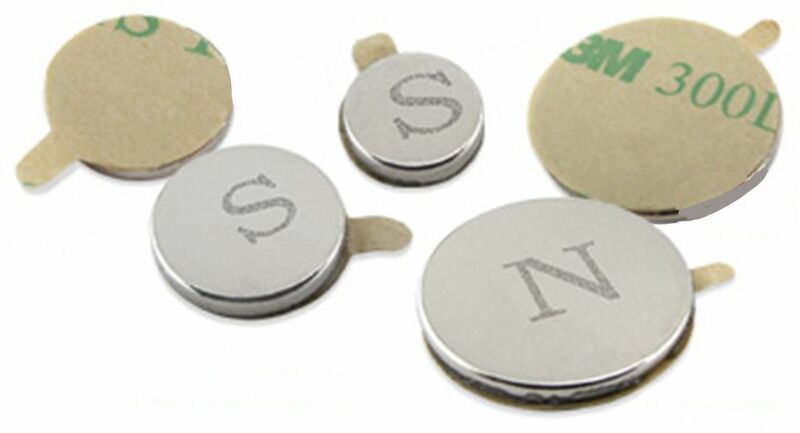 Neodymium grade 35 nickel plated magnet discs feature pre-applied, 0.005" thick, acrylic film adhesive. Pre-applied adhesives reduce assembly time in a variety of applications. 1. Magnet to Magnet: Use a North and a South magnet for added strength and “Snap-to” positioning. Magnets match up at same “Snap-to” spot every time. 2. Magnet to Steel Disk: Use a North magnet attracted to a steel disk for cost savings. Strength is slightly less than magnet to magnet. Magnet will attract to steel, but may not match up with same spot every time. The film adhesive adheres to all the same types of materials, but is thinner and better suited for applications with specific space requirements. The pressure sensitive adhesive forms a permanent bond with most HSE (high surface energy) materials, easily securing the magnet to the project. These magnets have a grade of 35 with a Gauss rating of 12,200. Maximum operating temperature is 80°C (176°F).